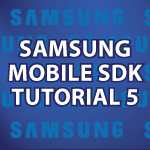 In this part of my Samsung Mobile SDK tutorial we will look at the Samsung SLook AirButton. AirButton is going to allow us to create custom menus on the screen and time the user clicks on an active area in the app with the SPen button. With Samsung AirButton you can use S-Pen to view content, select menus or insert images for quick content access. AirButton shows you information from anywhere and anytime and it can perform additional operations when you bring your S-Pen near the target view and press the side button. // is displayed in a horizontal direction. by the way, I signed up for the Samsung account and left a comment in one of your previous tutorials (do not remember which one) but it seems like the comment is deleted. I went to the previous tutorials to find my comment to see your reply but seems like I cannot find it. Really appreciate your will to share knowledge in such cool and professional way. Waiting for tutorials about Android Game Development..
You’re very welcome 🙂 It is my pleasure because I have met so many wonderful people all over the world. I have watched most of your tutorials and they are fantastic. I also signed up for the Samsung developer account and would like to be entered. I could really use a new device as I just started working at a software development company where I have been working on mobile android apps and having an up-to-date device to test them on would be great (the company I work for is cheap and my Droid DNA is far and above the most up to date phone we have to test on). Anyway, keep up the good work. I look forward to more tutorials. I don’t think you have done a tutorial on widgets yet and I think that is something that would be worthwhile to know. I’ve signed up for Samsung developer account. Wish me luck 🙂 . Thank you for all amazing videos. I watched all java videos from 1-19, OOD videos, and OOP is still little confusing to me. I feel like I am missing something. Maybe I need to practice more. Thank you again Derek. Derek, my comment still awaiting moderation. Sorry I’m answering them now. Ever since YouTube changed comments I have been getting many more then usual. Thanks for sharing, I want to know how to use SlookAirButtonAdapter.onHoverEnter , I can’t find out how to implement it in my code. When the pointer is entered the boundaries of parent view, this method is called. parentView – The view that was hovered. I just singed up for a samsung developers account.